LUCIDi4 has developed a proven solution for diaper and femcare manufacturers to extract real time data throughout the manufacturing process. We call it CLARITYi4. 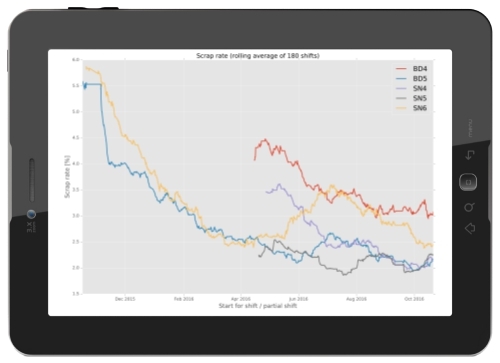 CLARITYi4 can be installed on legacy or modern production lines and delivered to production line operators and managers to address issues in manufacturing immediately and dramatically reduce scrap rates throughout the manufacturing plant. CLARITYi4 is designed to be installed with low impact to IT operations and virtually no downtime to manufacturing operations. Understanding the speed profile of the hygiene manufacturing line is the first step for any improvement. Line operators use the insights provided by the real-time chart which shows line speed for the shift in progress. Key performance metrics provide additional information required by frontline employees for their ongoing decision making process. 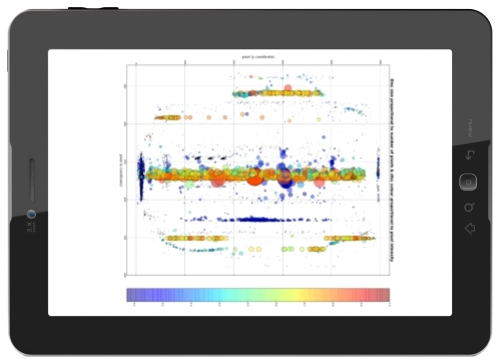 CLARITYi4 delivers real-time shift performance data allowing front line operators and managers to review performance to maximize production. 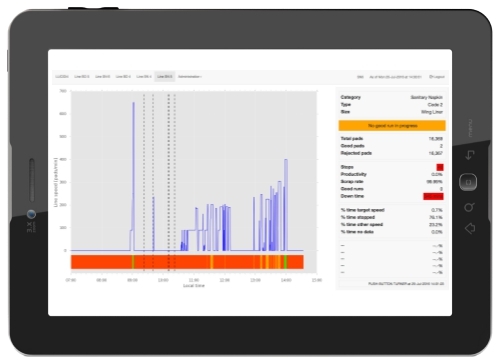 Achieving target production speeds following a line changeover requires realtime insights. CLARITYi4 provides real insight to all areas of the production line to identify critical issues and resolve them immediately. The Product Change Summary report shows line speed following a series of product changes, highlighting issues encountered while line operators attempt to run at target speed. Immediate feedback helps the team solve the issues at hand, leading to shorter delays before the line is stabilized. Production issues no longer have to be a difficult discussion between production leaders and senior management. 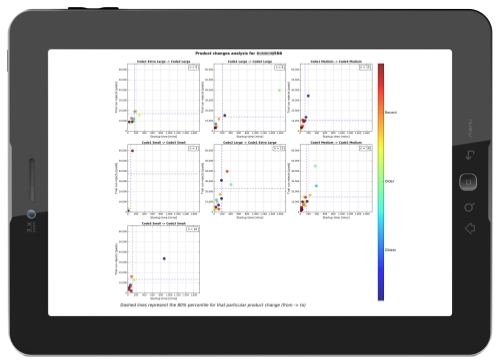 CLARITYi4 provides front line results and insight into weekly performance data. Weekly production line metrics help management keep a close focus on performance over recent weeks (left) and for the week-in-progress (right). Whether you operate a single or multi-brand facility, your ability to improve production performance and profitability for the company or your customers is measured in months and years. 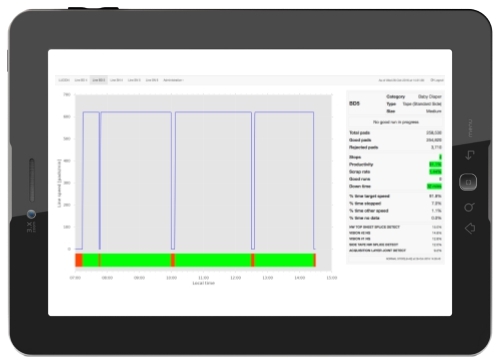 CLARITYi4 empowers you to track efficiency throughout the manufacturing plant. 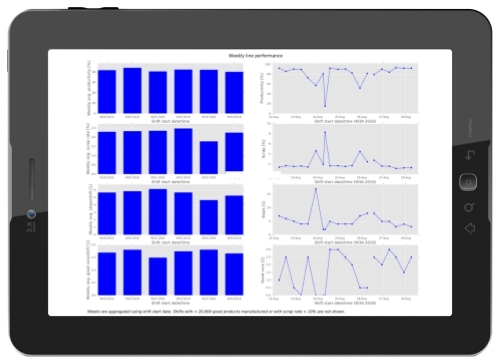 Data reports can be tailored to demonstrate production line performance and results to senior management, identify areas for improvement and opportunities to ramp production. LONG TERM SCRAP RATE REDUCTION? What is the real cost of your scrap rate? LUCIDi4 developed the CLARITYi4 solution solve the biggest issue in production facilities – SCRAP! Reducing scrap rates translates into direct savings for manufacturing operations. CLARITYi4 tracks and reports scrap rate reductions and progress achieved to ensure long term production goals are achieved. PRODUCT CHANGE ANALYSIS & KPIs? Advancing your manufacturing and production results requires detailed data and analysis across all production lines and product changeovers. 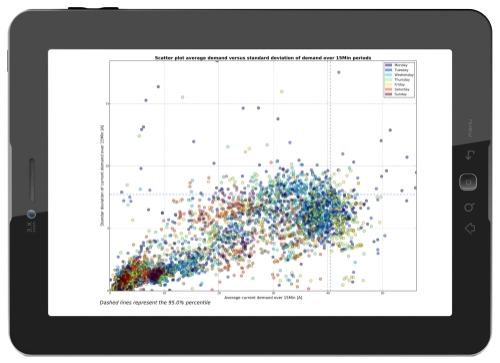 Significant scrap is generated during product changes CLARITYi4 monitors the time required to achieve steady production speed after a product change (x-axis) while tracking the number of rejects during each process (y-axis). CLARITYi4 gives you the insight and information front line production operators, supervisors and senior management need to improve process and production results. Understanding which types of rejects are more common than others helps hygiene manufacturers identify focused areas of improvement for line operations. 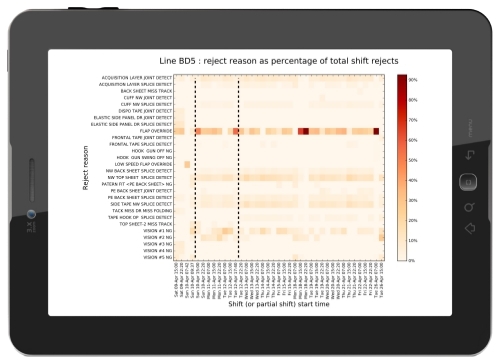 CLARITYi4’s heatmap feature highlights how common rejects are compared to other rejects for every shift. Product changes are highlighted by dashed lines to further segment when line changes occur and the impact to manufacturing performance. Power usage in hygiene manufacturing represent significant OPEX investment. 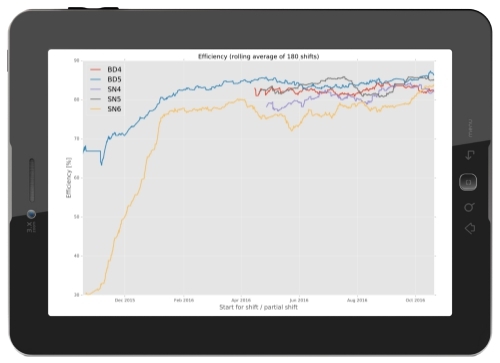 CLARITYi4 delivers data insights for real-time energy consumption and enables hygiene manufacturers to identify inefficiencies in power usage. With CLARITYi4, manufacturers can employ power consumption reduction targets across all aspects of the operations environment. Vision detection systems help detect visual issues with the products being manufactured. Having a deep understanding of where the defects are located on the product and how severe the issue is, helps identify the root cause which can then be addressed with data-driven decision making.